I’m In Doggie Heaven ! Today’s my lucky day ! Gary finally went to the pet store and got me treats! Thank God I don’t have to eat any more of those popsicles for treats! I’m over them. I think Gary is rewarding me. On Saturday, I told him to get out a bit and have some fun at the Hard Rock Casino in Tampa. I told him I’d be okay in the big RV doghouse by myself. So he took my advice and went out on the town. When Gary returned later that evening he came back $ 75 dollars richer! Now that was time well spent and the winnings can buy me alot of treats! Terry and Gary used to enjoy going to the casino together. Although they always had fun, they usually came home with their wallets a bit lighter (Big “L”). I think on Saturday, Terry was giving Gary (and of course me) a little luck from heaven. That’s the way to go Terry! Looks like you scored big in the treats department. Woo hoo and woof woof! I need to send Gary off to the Casino more often (to win more) as the money I have now for treats won’t last forever ! Woof, Woof ! Gary, Do you know how good Roxy is getting at this blogging stuff? I think Gary is going to get jealous, because I think I have a “Paws up” on Gary at doing thee blogs ! I guess I should have said both you AND Gary, lol. This is your post Roxy! Hey, I know what you meant. It gets a little confusing out there when responding back as there aren’t too many doggies like me out there that can blog as good as humans !! Well it certainly looks like Roxy won the Jackpot!!! I certainly did !! It’s like Christmas !! Thanks, Roxy. Keep taking care of Gary. Oh Roxy! You are in Doggie Heaven! Glad your Dad Gary had such a great day! for sure next time Roxy! 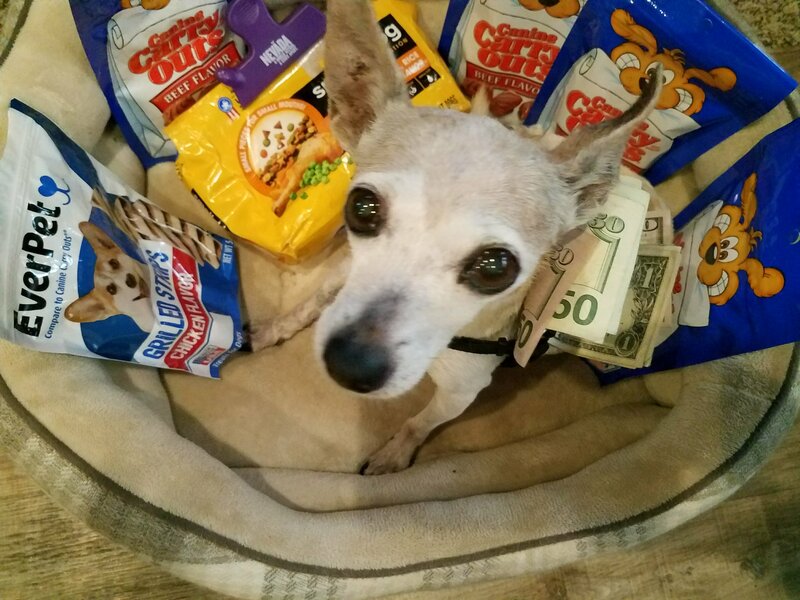 Hey Roxy, you look adorable surrounded by all those treats, you lucky doggie! You are an excellent blogger, too! We agree! These keyboards are good only for Baby Pyshka, but she is too small to type. Meows and Purrs, The Cat Gang ; Barmalei, Beba, and Baby Pyshka. Love you Roxy! you ROCK!!! Thanks CJ. Appreciate the complement ! Oh Roxy girl, you scored big time there. Nothing is better than a bunch of treats ! Yes, I think you will have to send Gary out again to the Casino, especially when your treat selection starts getting low. Roxy, you’re amazing! Keep track of Gary and make sure he has some fun. Haha! You´re so clever, Roxy! 🙂 Very well deserved treats! You take the biscuits and I will stick with the popsicles.